Give your dad the ultimate gift this Father’s day – his very own man cave! A garage man cave is less expensive than building a new addition onto your house and will take a lot less time, so it’s a great option for extra space. And it will give dad plenty of space to do ‘man things’. 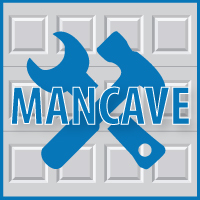 Below we will share a guide to transforming your garage into a man cave in 6 steps and pictures of some awesome garage man caves. The first decision you need to make with your garage space is how extensive you want your conversion to be. If this space is going to be used all day and night as a living quarters, and you live in an area with weather that gets very cold or hot, you have a lot more things to do to convert the space (i.e. heating, air conditioning, insulation throughout). However, if you are doing something simpler, such as an area for manly socializing, you can get by with less work. This decision is very personalized. When creating a primitive man cave, you can get by with very minimal if you think that’s ok with your dad. Or if you prefer to make it look like a room inside a home, that’s always an option it just requires a lot more work. If you plan on using any electronics, or if you’re putting in a pool table, insulation and HVAC are a must to protect your toys from extreme temperatures and humidity. Insulating the walls is necessary if dad will want it and if your garage doesn’t already have it. Detached garages will need more consideration to insulation because they don’t experience the heat or AC from an attached home. If your garage is unfinished, you can simply put up the insulation between the wall studs and close up the insulation by installing drywall. Paint the drywall with your color of choice. If your garage is already finished with drywall, that will just make this one less step to do. As you hang the drywall, take note of where the studs are; you’re going to need these when you hang dad’s favorite things – for example, basketball hoops, flat-screen wall mounts, and neon beer signs. Most garages are on a concrete slab, so this should be a much easier process. If you want insulated floors, as concrete can get quite cold, then you will need to put insulation down, and install floor boards. If you have floor boards, you can install carpet. If you are keeping the floors concrete, you can lay down large rugs or find carpet remnant pieces for your floor. It’s tempting to leave the bare concrete, but yoru dad and his friends are going to be on their feet shooting darts all day, so it’s better to put in some kind if supportive and forgiving flooring. Interlocking, rubberized tiles with a diamond plate pattern are the perfect solution. They come in all kinds of colors, so they’ll give the space a finished look that complements the hard work you’ve done on the walls. If your ceiling is unfinished you can leave it that way, but if you don’t like seeing into the rafters, you can finish it with some drywall and paint as well. Either way, you will want to install any lighting fixtures through the ceiling, a ceiling fan is nice to help circulate air, especially if you aren’t installing AC to your garage. Just like with the walls, take note of where the joists are, so you can hang that swag lamp over dad’s poker table. You can either bring in furniture from your home to the garage, or shop for new items, but you must have something for your dad and all his friends to sit on. Not to mention he will need to have food and drinks to offer so you need at least a bar sized fridge. A man cave isn’t a man cave without the right accoutrements. Make it something your dad will love. He might enjoy having the garage as a garage in some areas, with tools hanging on the walls or camping gear in the corner. Or you can trick the whole place out like a dive bar. Remember to make it comfortable, so there’s a place to relax between shuffleboard games. If you’re still into beer pong, you probably don’t care if you’re sitting on some stacked up milk crates, but if you’ve graduated to billiards and a home theater it’s time to invest in something softer. Also consider a kegerator, a liquor cabinet, a humidor, and a wine rack, to make it the man cave of a man, not a boy. Here are some great examples of garage man caves for inspiration – from the basic to extreme!